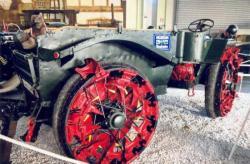 1 - Four wheels drive Diplock Tractor, 1902, with its studs 'pedrials'. 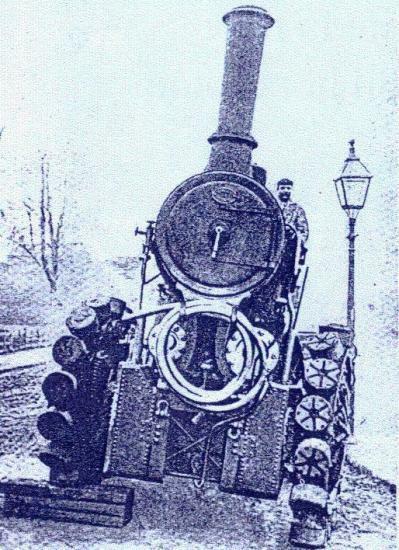 Pict from Revue des Engins 09/2002 by Francis Pierre issued from the book : In a century of Traction Engines published in 1959. 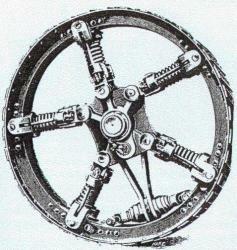 2 - Fowler wheel with spring system in 1870. Pict from Revue des Engins 09/2002 by Francis Pierre. 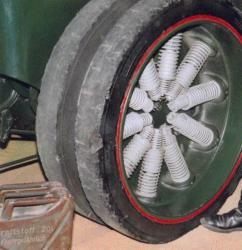 3 - Spring wheel for agricultural tractor seen in 2000 at the Sinsheim Museum, Germany. Pict J M M.
4 - Spring wheels in 1943 of the Meili firm tractors at Schaffhausen then Schübelbach, Switzerland, answered rather the shortage of rubber. Picture from book of Gerold Röthlin ‘From Autotractor to modern special vehicles’ from Verlag Gerold Röthlin, Kriens, 2004. 5 - A spring-wheel for all-terrain vehicle is submitted late to the Motor Show 1950. Pict of review l'Automobile, N° 54, Oct 1950, Special 'Salon de Paris', on Picassaweb. 8 - The Bendix 1969 weighs about 800 kg for 8.4 m long. The steel tires are 2 m in diameter, its titanium rings involved the suspension together with a rod connected to a torsion bar. An electric motor was attached to each wheel. Pict from the review 'L'Auto Journal', 9 April 1970. 10 - Robot wheels of Company VNII Transmash of St Petersburg. 12 - Rear view of an articulated Tolotti & Pavesi tractor, Milan, P4 model 1925, with solid tires and foldable spikes, seen in Sinsheim in 2000. Pict J M Maclou. 13 - Tractor Phoenix and Buckeye in 1916, with an average extra traction by retractable spikes. 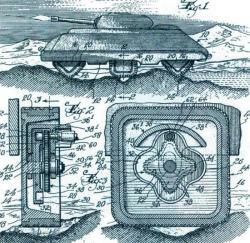 Picture from book of Fred Crismon ‘US Military Wheeled Vehicles’, Crestline Publishing (Motorbook), 1983. 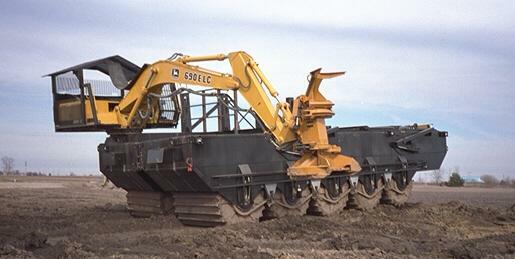 15 - LeTourneau L-2350 loader, with 4 m in diameter and 1.8 m wide tires. 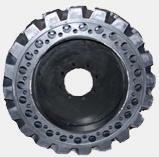 The mass of the tire alone was 6.8 t. The rim and the chain of protection were more. Huge ! 16 - Best Tractor Manufacturing Co in 1900. The wide wheels reduced ground pressure but congestion becomes maximum. Overall width requires a triangulation of maintenance. The tractor got stuck in bogs and extract has not been an easy task. Pict from Journal of Teramechanics, June 1979. 18 - The transport company CATCO, Alaska, still employs Bechtel vehicles of the 70's rebuilt among others by Rimpull. Pict from site flikr. 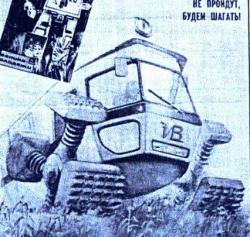 19 - MVTOu-2 in 1958. The Russians were not far behind. Pict from 'Les Véhicules tout terrain' Tome I by Alain Dupouy, Grenoble, 1995. 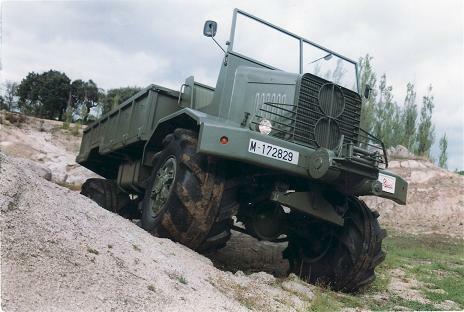 20 - Barreiros Truck, TT-90 from 1958 restored in 2008, equipped with 'Lypsoïd' tires. Pict from 1.bp.blogspot.com, which is no more in line. 22 - Amphibious craft with wheels, Quality Marsh brand, now Wilco Marshes Buggies & Dragline, Inc., Louisiana. 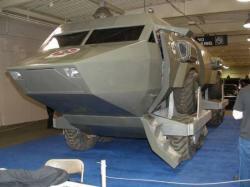 Pict from the good site www.amphibiousvehicle.net. 23 - Hydrostatic transmission amphibious buggy manufactured by AMG, St Gaudens, until the 80's. Weighing a total of 13 t, 2 t payload, it was powered by a Deutz 160 hp engine with wheels of 2.96 m diameter and 1.5 m wide. Speed of 8 km / h on land and 5 in water. It included an anchor into the ground by four rods to counter air turbulence caused by landing a helicopter on its platform. Today, the wheeled buggies are replaced by tracked vehicles. Pict from a brochure of AMG, J M M collection. 26 - It seems that Russians studied in the 60's tire rolled pipeline carrier, at least in scale model. Pict from 'Les Véhicules tout terrain' Tome I by Alain Dupouy, Grenoble, 1995. 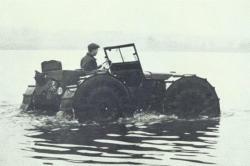 28 - The floating wheels made of large inflatable cylinders adapted by Nicolas Straussler in the 50's on a Jeep allow it to move in water. Pict from Wheels and Tracks N° 44, 1993. 29 - Rotoped of Julius Makerle. 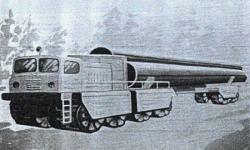 Although this picture is a reproduction of a drawing, this machine really existed. Pict Popular Science, Jan 1970. 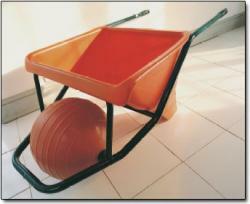 30 - The Rotoped system was simple : the ball in front of the wheel emptied while the back one swelled with valves. The wheel moved forward by gravity. Pict Popular Science Jan 1970. 32 - O. 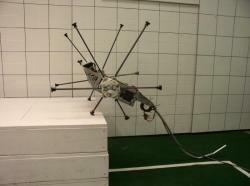 A. Goulden also undertook tests on scaled model. Pict from Revue Générale du Caoutchouc, Nov 1955, J M M collection. 33 - 'Meccano' construction set lends itself well to this kind of achievement seen in 1998 at an exhibition at the Porte de Versailles in Paris. 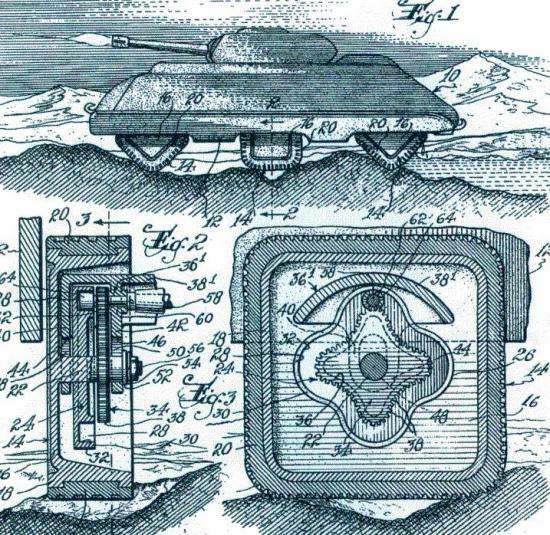 Pict J M M.
34 and 35 - Square wheels, whose patents have been found on the Internet, show that a practical implementation would be too complex compared to the advantage gained : crossing obstacles. 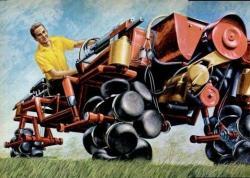 Pict from Popular Mechanics, Apr 1970. 34 and 35 - Square wheels, whose patents were found on the Internet, show that a practical implementation would be too complex compared to the advantage gained. 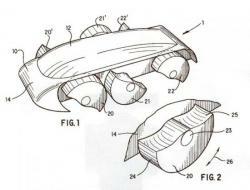 From Google patent. 40 - Running legs Russian vehicle. 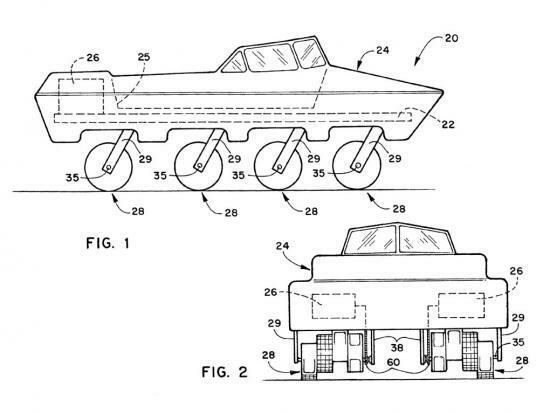 This is a drawing but no doubts that concrete realization would bring new in off-road locomotion. It is similar to Whegs, at the end of this chapter. Pict from the book of Alain Dupouy 'Les Véhicules tout terrain, Tome I', Alain Dupouy, auto-editeur, Grenoble,1995. 41 - Rhino had good amphibian qualities. Pict of Life Archives. 43 - Bottom view of Rhino. 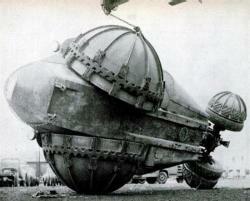 The center of gravity positioned very low and hemispherical wheels were preventing to rollover. What was it in reality ? It is doubtful as the ground path is narrow. Pict Popular Science, 1954. 45 - Terrastar in 1967 from the Lockheed Aircraft Service Company, Sunnyvale, California, a subsidiary of Lockheed. At the time, aircraft manufacturers were often diversified in all-terrain vehicles. Pict from Lockheed, J M M collection. 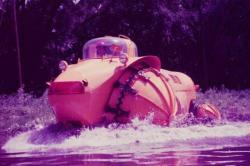 46 - Landmaster : it can be seen in action in the movie of 1974 : 'Damnation Alley'. The site of Dan Jeffries shows us the father of this extraordinary vehicle and other achievements. http://www. 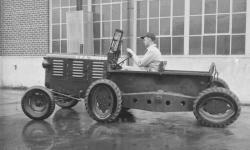 47 - The chassis of the Landmaster is in two parts. The Landmaster steers by articulation unlike the rigid Terrastar skid steers. Pict from J M M collection. 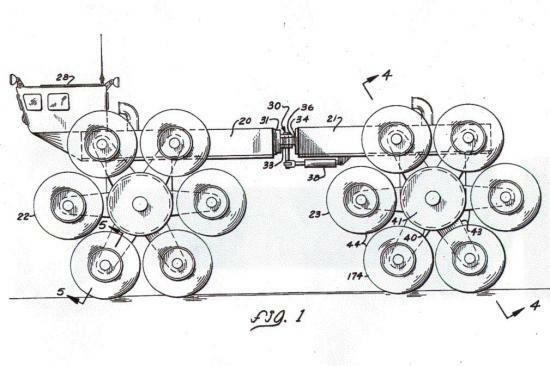 49 - 1965 patent of a star wheeled vehicle with 6 minor wheels by rotors. Times were favorable to little unbridled ideas and achievements that arose. Genuine innovations spread through different areas. us3208544. 50 - 'Meccano' model of a star wheeled vehicle seen in an exhibition at the Porte de Versailles in Paris in 1998. 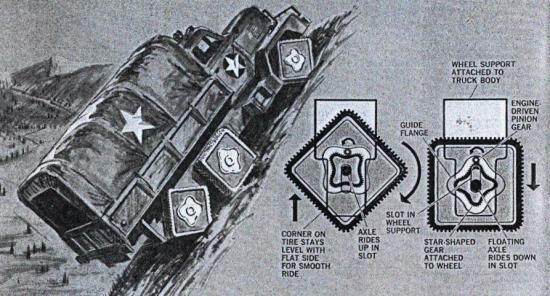 Pict from J M M.
51 - Whegs : amid pitch articulation promotes crossings. 53 and 54 - Whegs Impass : we can see the sliding rays automatically adaptable to the terrain. The mechanism must be sealed for outdoor use but the practical implementation must be delicate. After a few changes over the centuries, the wheel, invented more than 5000 years ago, only really began to evolve at the 19th and 20th centuries. The roads, long little passable, and development of mechanical traction stimulated inventors whose ideas were sometimes eccentric. 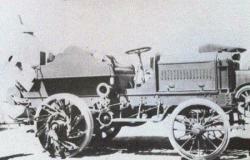 In 1902, Taskers built a steam engine with four-wheel drive and steering, already uncommon machine at the time, the Diplock (photo 1). In addition, he fitted its wheels with articulated studs 'Pedrial' that would allow a better distribution of the mass of the craft on the ground and a better crossing. In fact, the vessel would run very slowly to avoid zigzagging. They invented later, in parallel with the tires that will prevail in the 30s, springs wheels : they can see, among others, the Fowler wheel (photo 2) for steam tractor with a spring system and deformable steel rim, which did not give satisfactory results. There were many spring wheels prototypes (photo 3 to 5). 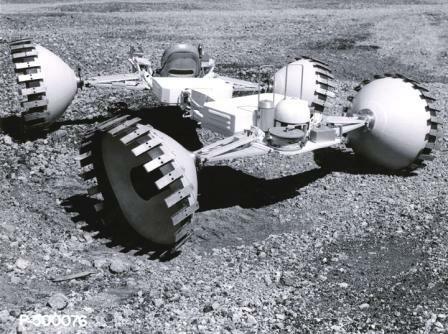 The idea of flexible wheels this time in titanium was incorporated into the 60's on some prototypes of sophisticated lunar vehicles, rubber becoming brittle at low temperatures and air rarefied. These were : Grumman MOLAB (photo 6), Grumman LRV (photo 7), Bendix (photo 8), Boeing 4x4 which ran on moon (photo 9) with wire wheels, so that a Russian robot of VNII Transmash (photo 10). 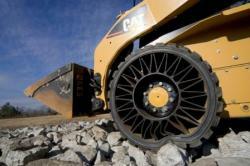 Today and after a long eclipse, the metal wheel comes back with Michelin's Tweel (photo 11). The full-tread narrow tires were widely used before the 30s (photo 12). 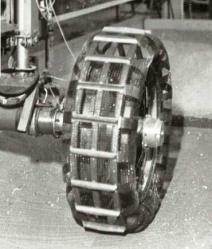 Spikes foldable or collapsible (photo 13) or wheel cages helped traction. The tread wheels, longtime dropped, come back on the market for about fifteen years in construction equipment. The wheel 'Rubbertrax' is a representative of this category (photo 14). Tires established themselves in the 30's. These, Firestone trademark, the largest in the world are assembled here on the Letourneau loader L-2350 (photo 15). 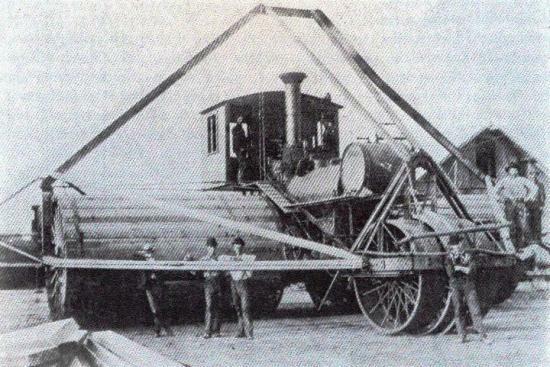 In the absence of tracks in 1900, Best Manufacturing Company produced this heavy steam tractor (photo 16) with two rear drive wheels for operating in the peat of the Sacramento Valley : the basic wheel 2.8 m diameter was surrounded by wooden bars of 4.7 m wide. It was not looking then the reliability or very good traction. At the same time, they invented the crossbar straight, diagonal or chevron. The wide wheels experienced a modern version in the 50s, known as the Rolligon (photo 17) (see article on Rolligons) built by William Albee of Carmel, California. 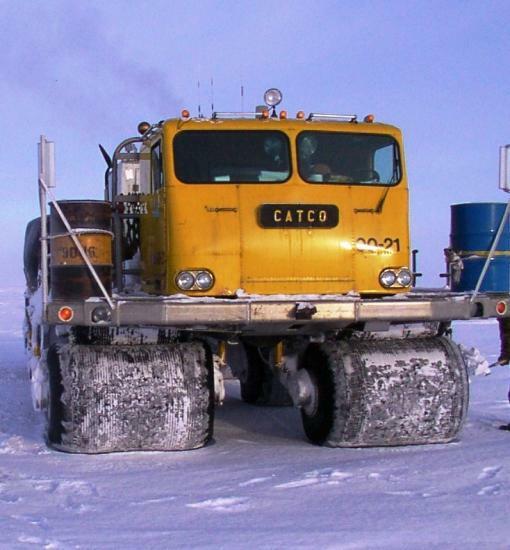 Today, the Catco, huge trucks of Bechtel trademark (18 photos) and equipped of Rolligons to preserve soils furrow the North Slope in Alaska for the oil industry. The Terra-tires are corollaries of them narrower and more resistant from Goodyear, the first to manufacture them. 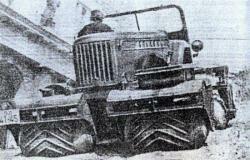 The Russians have tested the rolls-tires on various models from 1958 (photo 19), tests not followed of series. 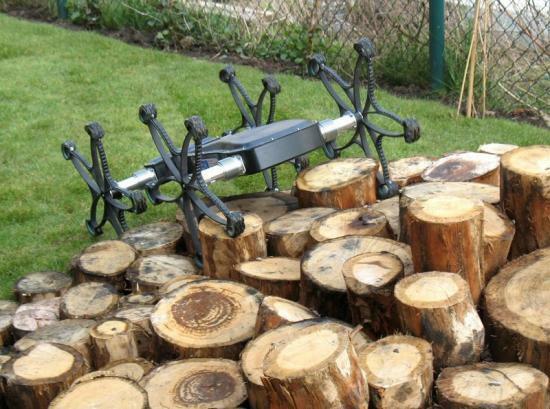 The tires 'Lypsoïd' (photo 20) invented by Nicolas Straussler at the same time were also very large but without sides. 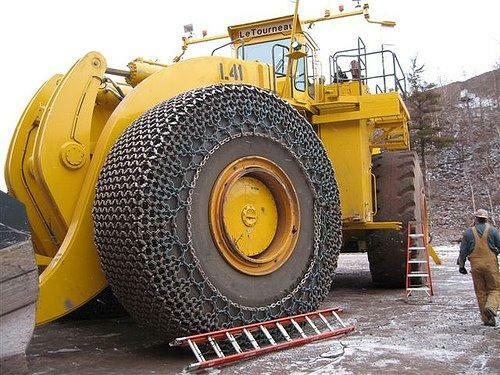 In Russia, there are always the same types of tires (photo 21). 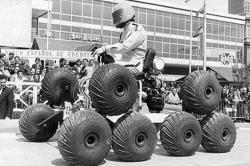 The Rotoped (photos 29 and 30) whose prototype was built in 1964 by the Institute of Automotive Research in Czechoslovakia, had 4 wheels. They were fitted with balloons that were inflated and deflated through a valve system on a circuit compressed air : a deflated balloon before the wheel while the other was swelling at the back which allowed the vehicle to move by gravity. As there was no driving force, the wheels could not skate. 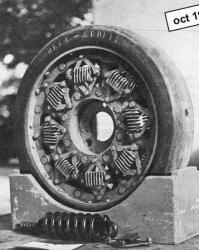 The absence of drive shafts allowed each wheel to move 180 ° and the vehicle could move perpendicular to its original path or crab. The top speed was 20 km/h and the maximum slope reached 20 degrees. An assisted steering completed the set. The inventor, Julius Mackerle, was director of motorization in Tatra until 1958 and then became director of the Institute mentioned above. He thought at the time using his system for locomotion on Moon where the gravity lower than on Earth reduces the adherence of a classical wheel based on friction. The lack of atmosphere on the Moon would reduce the inflation pressure of the system so the required power and mass. 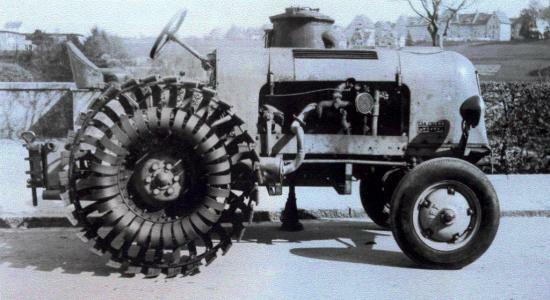 A snow crawler tractor Allis Chalmers M7 was transformed with ellipse shaped wheel (photo 31) and tested in 1946 : the wheels were no longer skating by turning on themselves, but one must penetrate and serve of anchor while the other, flat, had to bear the weight of the vehicle. The pulling force would be doubled. A balance between the 2 wheels chocked to 90 ° allowed to maintain the horizontality of the whole. 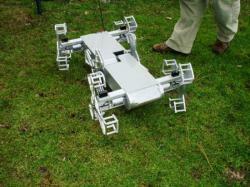 Nevertheless, this prototype did not give satisfaction in the mud (but width of 'wheels' was small), vibrated a lot on road and was abandoned. Photo 31, taken in 1950, reappeared recently after the photos archives of LIFE magazine was online. 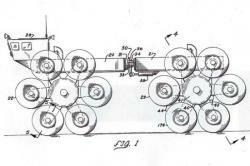 John F. Kopczynski, graduated from the Rochester Institute of Technology, took numerous patents on the elliptical wheel from 1940 (they are available on the U.S. patent site). The idea of the M7 prototype vehicle came well from him. He nevertheless continued his research in this area. 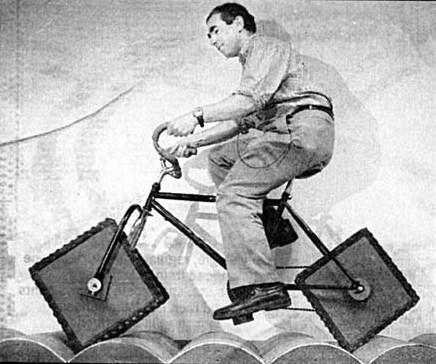 The scale model tests, conducted in 1949 in the mud showed, according him, that these elliptical wheels did not slip and did not turn on themselves. The model was traveling at 40 km/h without vibration. 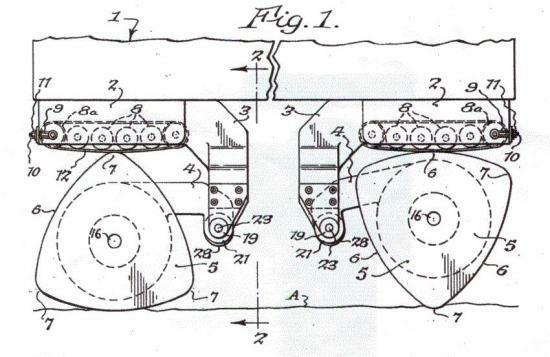 J. Kopczynski took 80 patents during his life and not just the wheels. He became president of Ascension Industries in North Tonawanda, New York, a major metalworking at the same time as mayor of this town. He died in 2005. Osmund Anthony Goulden of Sunbury-on-Thames, Middlesex, also patented the oval wheel in 1961 after testing model as well (photo 32) dating from 1955. 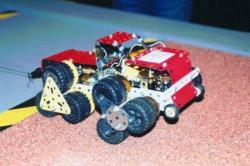 This model 'Meccano' (photo 33) was seen in 1998. The theoretical inventions being limitless, patents with square wheels were also expected to increase traction, made their appearance (photos 34 and 35). There are no known practical implementation except a bicycle (photo 36) with square wheels and special road. 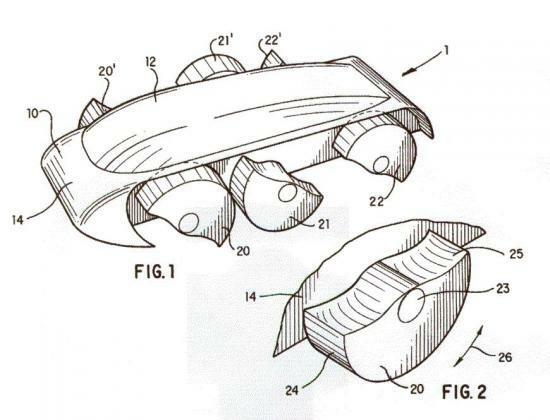 Another idea patented by J. Kopczynsky in 1987 was to replace the circular wheel of a vehicle by curvilinear triangle shaped wheel (photo 37) with the same theoretical advantages as the oval wheel. The upper part drove the triangular wheels by friction. The vehicle must remain horizontal on flat ground with the properties of the curvilinear triangle. 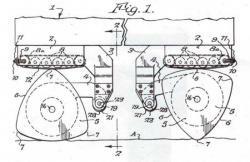 Similarly, the invention of semi-wheels (photos 38 and 39) appeared in several patents. These half-wheels were able to roll horizontally on flat ground and a better 'hook' in difficult terrain. They joined a little current 'Whegs' and 'Rhex' (see Chapter 9) whose discontinuous or missing rims wheels promote difficult progression. 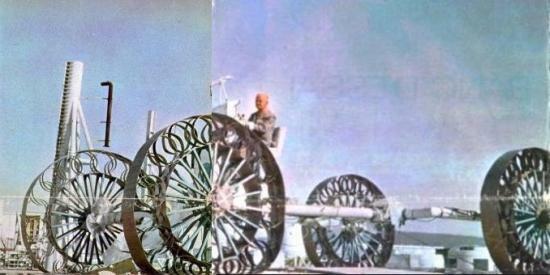 The Russian model with 'legged' wheels (photo 40) was within the same idea discontinuous rims. 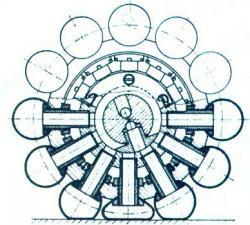 6 - Hemispherical wheels and 'Rhino' or 'Polywog'. 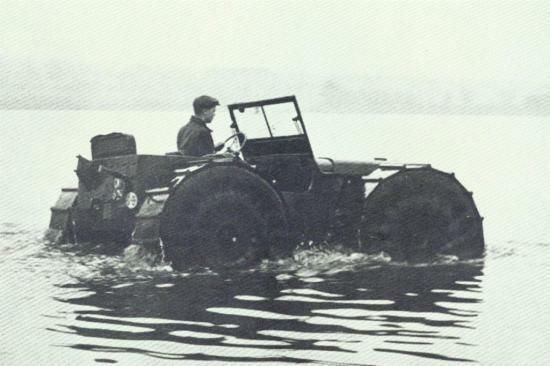 The publication 'Popular Science' of September 1943 described an amphibious vehicle, "The Roller" with two large hemispherical wheels, capable of going anywhere and replacing the track. It was not until 1954 that a prototype (photos 41 to 43) was commissioned by Elie P. Aghnides at the Marmon-Herrington Company of Indianapolis, Indiana. 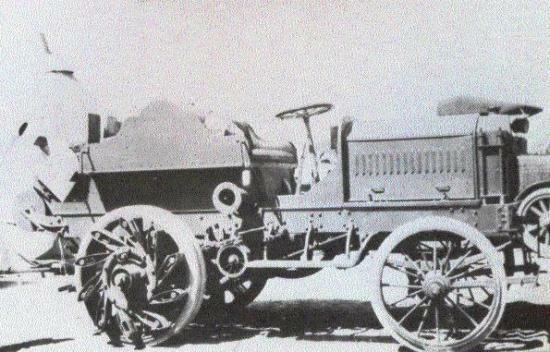 Engineers of Marmon-Herrington stretched the vehicle relative to the initial request of E. P. Aghnides for stability matter. 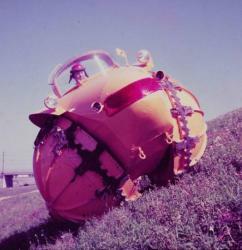 The two large front half-spheres, V mounted, contained strips of rubber for traction. The low center of gravity and the shape of wheels should prevent it to overturn. 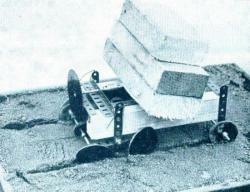 The small rear drive wagon steered wheel also steered the vehicle. 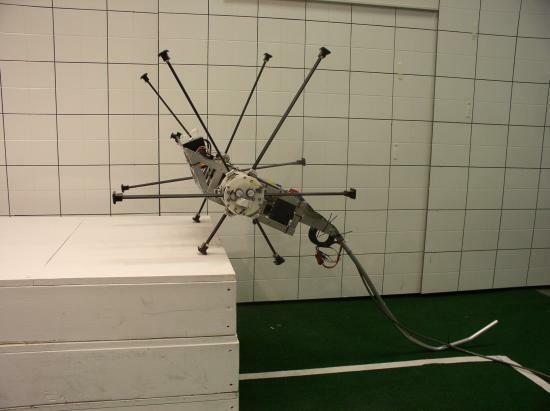 A hydrojet swiveling 360° mounted between the wheels allowed it to move easily in water. 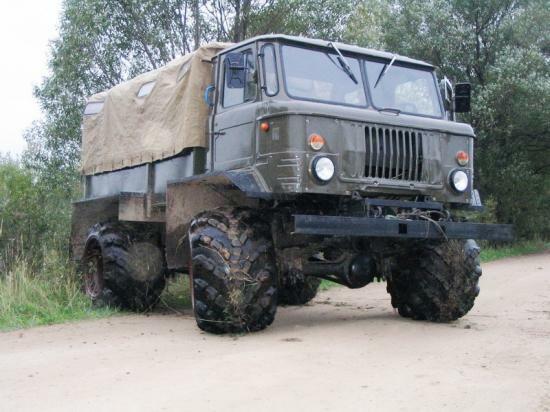 It weighed 4.5 t and its Ford 6-cylinder engine of 130 hp theoretically allowed 75 km / h. Its behavior in difficult terrain, mud in particular, proved excellent despite the lack of suspension. A smaller version was also built by Marmon-Herrington. But who was that Mr. Elie P. Aghnides, inventor and owner of the so original 'Rhino' ? This Greek-born engineer living in New-York invented, as revealed in Life magazine of August 5, 1946, a new mechanism for mixing air with water jets in the domestic water as showers and sinks and break the jets. 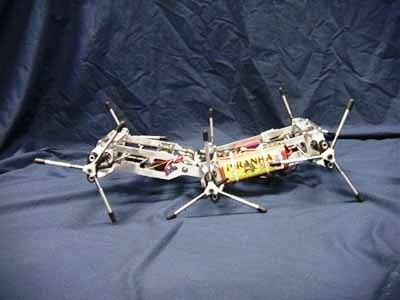 This enabled him to earn enough money to build the 'Rhino', the big and small. He caused and had to undergo several lawsuits related to its patents on mixing with water. 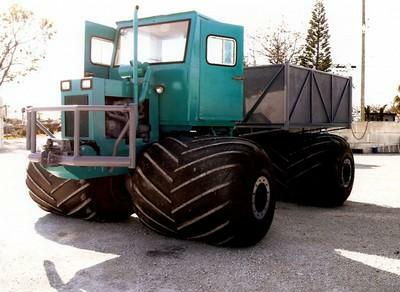 He sued in 1972 Marmon-Herrington Company for non-compliance and not informing the complainant about a contract to build a revolutionary vehicle equipped with 2 aligned hemispherical wheels, the 'Cyclops'. He won the case the result was for him by the recovery of $ 120,505.40. 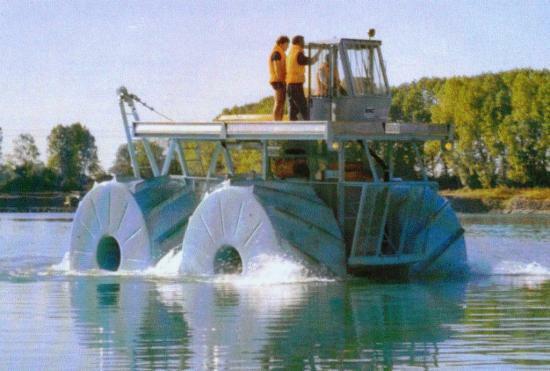 Too bad the 'Cyclops' was never built ! Elie P. Aghnides died in New York in the early 80s. and wonder if this prototype does not become fashionable on the Internet, at least for the specialists. What happened to the two prototypes ? Both versions of Rhino stationed at Marmon-Herrinton in Indianapolis in the early 60's but the company moved to Knoxville, Tennessee. The 'smaller' was then destroyed when the 'Rhino' was bought by Eugene Pock and Sons Inc. of Zionville, Indiana, who preserved and presented every year thereafter the second weekend of August to Mid America Threshing and Antique Show in Tipton, Indiana. However no pictures of these events with the Rhino reached us and no further communication or publication was emerged over the last twenty years. From there to say it had been scrapped, there was only one step. After much research, emails and telephone calls without success, and even the contact of Don Shew, official historian of Marmon-Herrington, the author was recently confirmed that the vehicle was just in Lebanon, Indiana in Eugene Pock Jr. who restores it. It will certainly emerge one day. It would have been a pity not being able to admire this strange specimen of the American dream of the 50's released in the press and newsreels (visit the Gaumont archives site) and then able to dream of many young people in many countries. Today, became older, they can through the Internet to trace the fabulous gear. In this section, finished motor vehicles but long live the wheelbarrow : its low pressure spherical wheel (photo 44) allows it to roll smoothly over bumps, much like the Rolligon. Another wheel deformable ribbon shaped fitted on a wheelbarrow seen in the 'Book of Inventions' allows the same thing. The idea is old and star wheeled carts are still rising stairs. 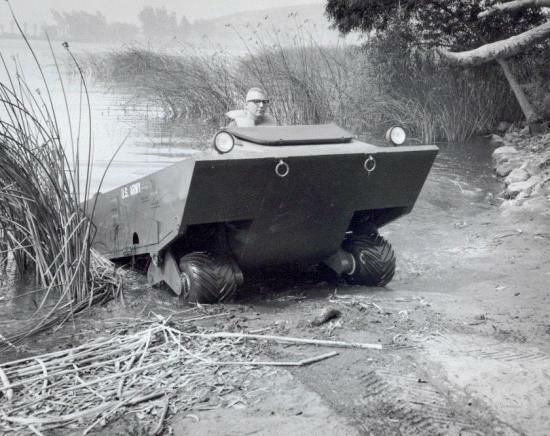 Still, Robert W. Forsyth and John P. Forsyth of Lockheed Aircraft Service Company of Sunnyvale, California, built in 1967 the Terrastar (photo 45), stairs climbing vehicle but behaved better in mud than on rocky terrain. 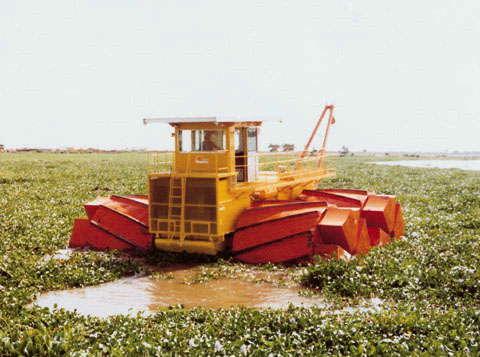 The craft was amphibious where, thanks to its large rotors, it was going well in water (12 km/h) but his favorite field was deep mud in which it excelled. 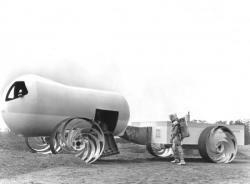 On the main road, rotors were fixed and the 12 wheels 8 of them in contact with the ground, turned on themselves and propelled the vehicle at 55 km / h. Its was skidd steered. Unfortunately, some complexity of the craft may have played against it and also a small payload compared to its mass : 1120 kg empty and 1635 kg full load. 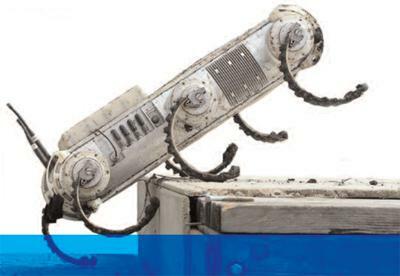 The Terrastar is now stored outdoors for several decades at Waterways Experiment Station in Vicksburg, Mississippi. Dan Jeffries, coachbuilder in Hollywood, returned to the same concept in creating the Landmaster, one of the stars of the film 'Damnation Alley' in 1974. He appeared in television series before being completely restored in 2007 (photo 46). The vehicle steered by articulation (Photo 47), unlike Terrastar. We could see at the auto show from Barcelona in 1972 a similar small craft the 'Gato Arena' (photo 48) and identify numerous patents on the principle of the star wheel (photo 49). Evidence that the principle is known, 'Meccano' models were built (photo 50). What means Whegs ? Simply 'Wheels' and 'Legs'. Whegs Robots (photo 51), very current, of University of Case Western Reserve in Cleveland, Ohio, uses legs that roll like wheels. 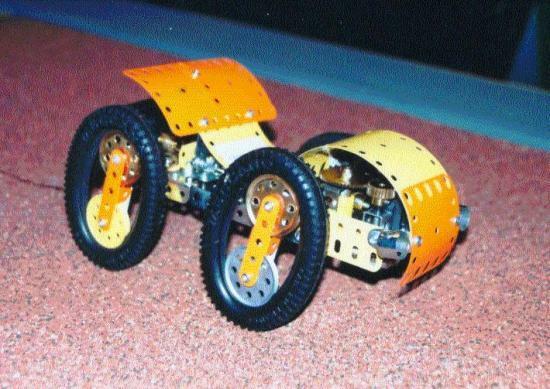 The result is spectacular : nothing seems to stop these little robots whose several versions exist, the later having beginnings of rims connected to the arm (Photo 52). The Wheg Impass (photos 53 and 54) also includes an even system of sliding shelves that allow more possibilities. University of Bremen also builds very impressive Whegs : the Asguard (photo 55). The Rhex (photo 55), designed on the same idea by five American famous Universties including one of Cargenie Mellon, Pittsburgh, Pennsylvania, is now marketed by Boston Dynamics, Waltham, Massachuchetts. 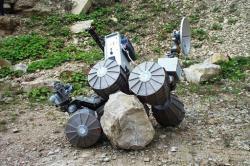 The rocks do not scare it and if it overturns, it can quickly get back on its feet and continue its travel. 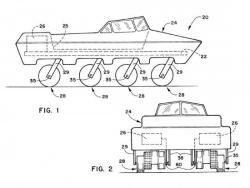 Again, several versions exist with different arms or even amphibious versions where the arms act as fins. 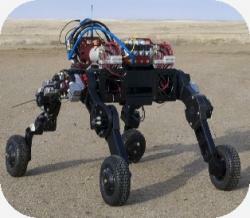 The Toolkit (photo 57) of Collineo and DRDC (Defence R & D Canada) has legs in two parts. Anyone have any info on the current status of the rotoped or rhino? as in, do they still exist or were they scrapped or lost long ago?